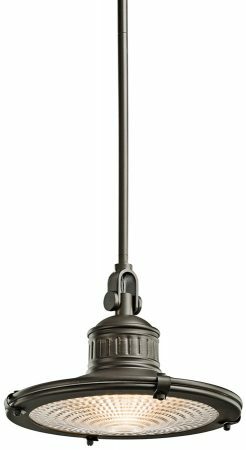 Part of the Sayre industrial style designer kitchen lighting range finished in antique pewter or olde bronze, supplied by Elstead Lighting and designed by Kichler. A homage to the security and pragmatism of the historic lighthouse, the Sayre collection utilises a prismatic lens, creating a focused beam that is both supple and controlled. This collection features wide, flat pendants embellished modestly with a subtle ribbed design. Available in antique pewter and olde bronze finishes, these industrial style kitchen fixtures are the ideal complement to any kitchen, bar, restaurant or workspace. 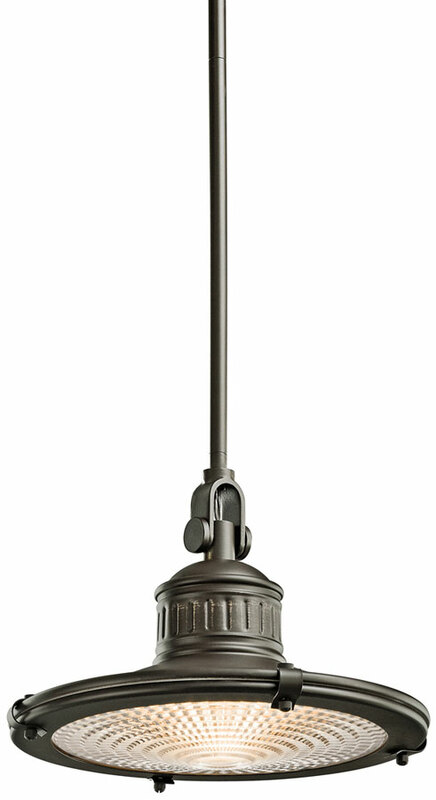 Superb quality medium kitchen pendant, suspended from a circular 127mm olde bronze ceiling mount by a central drop rod. The medium industrial style flat profile 30cm shade is finished in olde bronze and features a ribbed top section and flat prismatic glass lower lens secured by matching clips and thumb screws. Other fittings in the Sayre industrial kitchen pendant range can be viewed below and includes different sized pendants finished in antique pewter or olde bronze.